The telegraph building in Podebrady,from where shortwave broadcasts began in 1936. The Czechoslovak government realised it had no effective tool with which to counter the hostile propaganda riding the radio waves. Radiojournal's foreign-language lectu res, broadcast on medium wave, were clearly insufficient for this task. 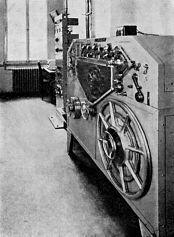 There had, however, already been attempts to broadcast abroad on shortwave frequencies: between 1924 and 1927, the Prague firm Elektra developed valves (Am: "tubes") that it started to manufacture for radio equipment. The results were heard as far away as Great Britain. So in the early 1930s Czechoslovakia's Ministry of Foreign Affairs came up with the idea of creating a shortwave service which could be heard clearly abroad. The attempts are well illustrated by a Foreign Ministry memorandum from late 1934 on the use of radio for promoting the country's interests, in which the ministry warns of "the need to establish a shortwave service. This will allow us to broadcast propaganda to foreign countries, propaganda which states such as Germany, Hungary, Italy and the Soviet Union will be able to understand." 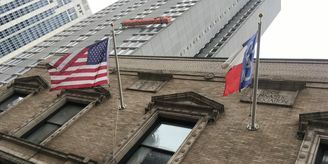 The Foreign Ministry pointed out that an international service would also allow constant contact with Czechoslovak expatriates living in the United States. The ministry proposed that the establishment of a shortwave station should be diverted from the Ministry of Post and Telegraphs, and that the task should be described as a special measure for the defence of the state. In 1934 the Minister for Post and Telegraphs announced in parliament that a shortwave radio transmitter for promoting the interests of Czechoslovakia abroad would be built in Podìbrady. According to reports in the press, the sum of 3.5 million crowns of public money was earmarked for the task. 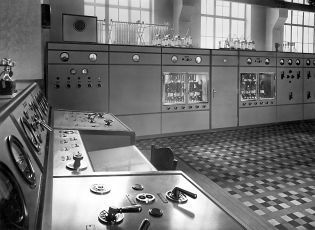 Shortwave transmitter at the telegraph building in Podebrady In 1935 workmen began assembling shortwave transmitters and antennas at the telegraph building in Podebrady, which belonged to the Ministry of Post and Telegraphs. 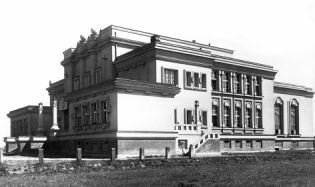 The building, nicknamed the "Radiovka" by local people, was built in 1923. In 1936 engineers put the finishing touches to two Marconi transmitters and an SWB9/30 transmitter. The SWB9/30 had an output of 34 kW, and was capable of operating in the band from 13 to 100 metres. It was this transmitter that was first used for the new international service. Trial broadcasts, lasting several hours, were launched on July 24. From August 13 - 14 the transmitter broadcast a total of 24 hours of programmes. The broadcasts consisted of gramophone music, interrupted at 20 minute intervals by recorded messages in different languages. The gramophone records were played in an improvised studio at the Podìbrady transmitter building itself. Regular broadcasts began on August 31 at 10 a.m. and were relayed from the Czechoslovak Radio building in Prague. The programmes were a combination of recorded music and announcements by presenters in various languages, which were broadcast live. 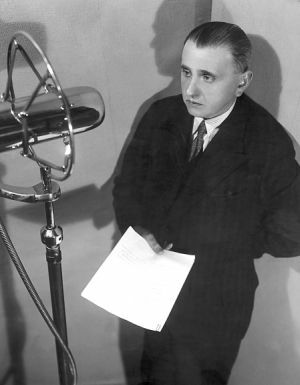 Czechoslovak Radio Technical Director Eduard Svoboda, who launched the first the foreign broadcasts on August 31, 1936. 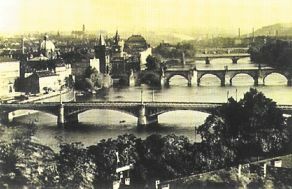 The broadcasts from Prague began on August 31, 1936, with a speech in English by the Technical Director of Czechoslovak Radio, Eduard Svoboda. This date is considered the birth of international broadcasting in Czechoslovakia. Blatnerphone The main aim of the international service was summed up in 1936 by the Minister for Post and Telegraphs, Alois Tucny "The Podebrady radio transmitter will complement the existing radio network and the broadcasts will be the responsibility of the Radiojournal radio company. It goes without saying that the station will to a great degree - as is the case with foreign shortwave services - provide state propaganda and information in the world's major languages, and also provide special programmes for those Czechs and Slovaks who have settled abroad and who cannot receive our own domestic radio programmes. The mission of this new shortwave service will also be important because our culture - and especially our music - will find new audiences around the world, allowing us to show other European states to what extent we have contributed to the development of mankind in an atmosphere of friendly competition." In the first few days the station broadcast a total of 6 hours per day on shortwave in three two- hour segments: from 10:00 to 12:00, 17:00 to 19:00 and 20:00 to 22:00. From September 13 transmissions were divided into European broadcasts (from 20:25 to 22:30) and American broadcasts (from 03:00 - 05:00 on Tuesdays and Fridays only), and the first news bulletins began. In the beginning the programme consisted mostly of concerts, recorded on the so-called Blatnerphone, the predecessor of the reel-to-reel magnetic tape recorder. It was a bulky and heavy piece of equipment for the magnetic recording of sound onto narrow steel tape. Announcer Zdenka Wallo The spoken word appeared only in news bulletins and to introduce programmes, and the presentation was always live (in the European broadcast news bulletins were delivered in Czech/Slovak, German, French and English, while in the American broadcasts news was read in Czech/Slovak, English and occasionally Russian). Other written material consisted mainly of lectures, at first just in Czech, occasionally in English. The shortwave section of Czechoslovak Radio was located in two offices in a building situated near the rear entrance of the main Czechoslovak Radio building. About eight people worked in the two offices. 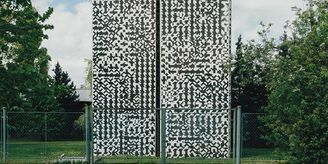 One of them was Mrs Zdena Wallo, a well-known Czechoslovak Radio announcer, whose language skills made her an ideal candidate for the shortwave section. 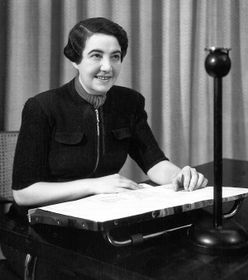 Also working in the shortwave section was Helena Kronska later Helena Stepanova: "I joined the shortwave section of Czechoslovak Radio in 1936. I was responsible for listeners' letters. 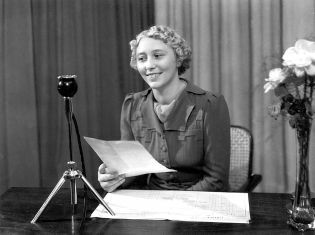 Once - it was still in 1936 - they came to me and asked if I could step in for Zdenka Wallo, who had been taken ill. My broadcasting premiere went well, and from then until 1939 I worked as an announcer as well as doing the letters. I would appear live and tell listeners what was coming next, then came the news, and after that I would give the signal to the technician who would play music from the Blatnerphone. Then I did the same thing in other languages: German, English and French. We announcers had to be able to announce the programmes in all the languages." Announcer Helena Kronska As well as the broadcasts to Europe and America, from 10:00 - 12:00 and 17:00 to 19:00 the shortwave service also relayed extracts from Radiojournal programmes. The response to the first Radio Prague broadcasts was encouraging. Letters from listeners began arriving in early September and by the end of 1936 a total of 4,443 had arrived at the station. There were 267 letters from Czechoslovak expatriates, half of which were from North America. As Helena Kronska recalls, a meticulous record was kept of all letters. "Letters came from all over the world, mainly from England and America. I wrote answers and recorded the details of all correspondence. 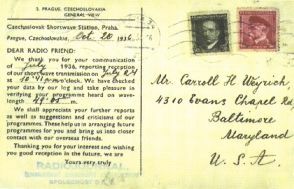 I took the reception reports to the Technical Director of Czechoslovak Radio, Eduard Svoboda, who was extremely interested in where the listeners picked up our signal - and how well they heard our broadcasts."